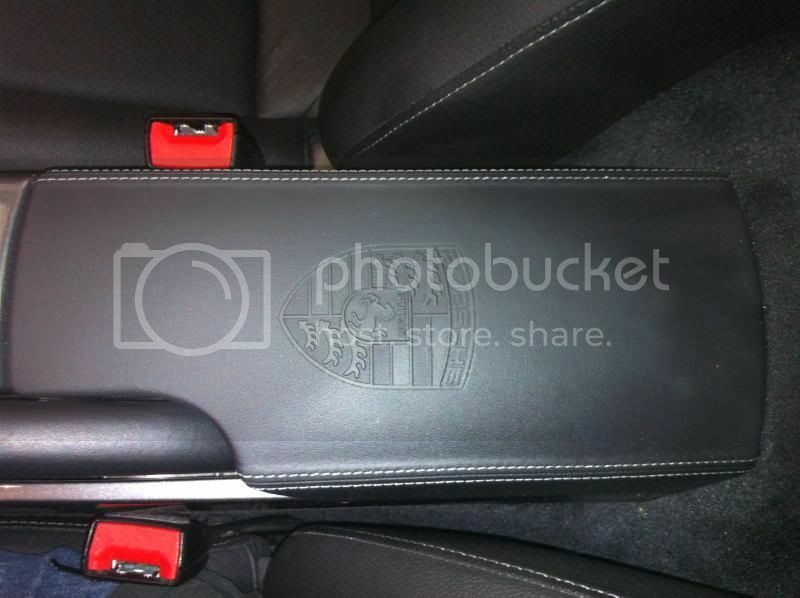 Am looking for a black Porsche 997 center console cover with the porsche crest to match the crest on my black seats. Anyone have one for sale? Need a vin# with one on it to order from Porsche Exclusive. so your dealer is lazy? asked them to order 8mths ago and thay have never followed through-thought maybe I would do better on a forum. This is part of the Porsche Exclusive Equipment and can only be ordered as a replacement unit for a vehicle already equipped with this option. You will require a VIN# from this vehicle and provide this to your local Porsche parts counter. I've had the 'more normal version' for quite some time. Bought from Suncoast. It's just 'OK'. It's not as black as my cabin leather and the stitching really isn't real. Put a little leather conditioner on it and it tends to 'blacken' it up some. Other than that it looks fine and the cost was well within 'reasonable'. I think I bought it when they had some sort of special pricing ($269.95). Bottom line it's nicer than my old plain leather one. I had this one on my cayman and bought it again for my 997. You will need to use leather conditioner to bring out the true color, all Porsche leather comes untreated from the factory. A little schmutz will change the color dramatically. It is really stitching, not sure about the comment from AP_997S. It's real string! It was one of the first upgrades I did on my Cayman, makes the stock lid look terrible by comparison. Here is a photo of mine in my cayman. It's a pretty nice upgrade for not too much money. I don't know what the more expensive one has over this one unless the leather is from the belly of a rare mountain goat or something. I'm going to take a closer look at mine regarding the stitching. It looks fake to me but it might be real. The leather just isn't in the same class as the cabin leather (IMHO) and although I do spread the over priced Porsche Leather Conditioner (little black bottle) it still does't appear as black as the seats, etc. It just might be the grain and quality. I'll shoot a picture today and post it. ps. Yours looks great next to the painted console. Love mine. Also the lower cost one from Suncoast! What is the difference between the $289 and the $769 lid? The premium version has a slightly stronger leather smell, and the Crest was slightly (and I mean slightly) different looking. It's hard to tell the difference. I only recommend the premium version for folks with full leather consoles. For everyone else, save the money and buy this one. Got my less expensive version from Suncoast and love it. I see nothing wrong with quality or diff in leather.